Site prepared by Kimball Thurlow, purely to share experiences. 2013. My enjoyment with Märklin model trains. 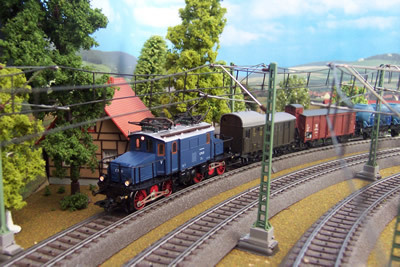 Märklin (in English Maerklin, or Marklin) along with early 20th century electric train manufacturers, used a low voltage AC, 3 rail track system. Other 3 rail systems used DC voltage, and included well known brands such as Hornby and Hornby Dublo in UK, VB and JEP in France, and Lionel in the USA. Märklin have persisted with the 3 rail AC system, and since the 1990's, adapted it perfectly to a digital format. in Germany, DB = Deutsche Bundesbahn, set up in 1949 in the western part. DRG = Deutsche Reichbahn Gesellschaft, 1920 to 1949. DR = the post-1949 system in the eastern part. In France, it is SNCF (Société Nationale des Chemins de Fer Français). DSB, is an abbreviation of Danske Statsbaner (Danish State Railways). Maerklin as a manufacturer, have existed for over 150 years. They began producing tin-plate or sheet metal doll's rooms and prams, and then other toys, including cars, boats and trains. Maerklin's factories are currently in Goppingen, Germany, and Gyor, Hungary. They supply all (apart from soft scenic items) the hardware to create a realistically operating model train system.